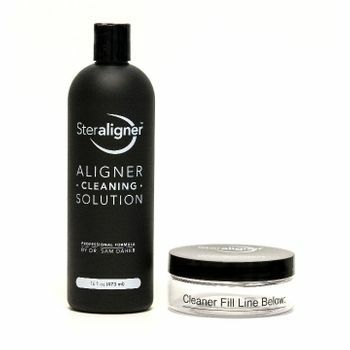 Steraligner Aligner and Retainer Cleaner - Persulfate-Free! NEW! Introducing a convenient new Persulfate-free way to clean your Invisalign aligners and retainers! Steraligner removes 99.9% of bacteria*, and also removes plaque and tartar from your clear aligner. Steraligner was developed by Sam Daher, DDS, a leading orthodontist and lecturer, to provide a better and more effective cleaning system for his orthodontic patients. Unlike powders or tablets, Steraligner (pronounced STER-a-liner) is a liquid that works immediately to clean and sanitize your aligners in just 3 to 5 minutes. With daily use, Steraligner can help reduce yellowing, staining, and bad breath caused by dirty aligners. It leaves your dental appliance sparkling clean and minty fresh. 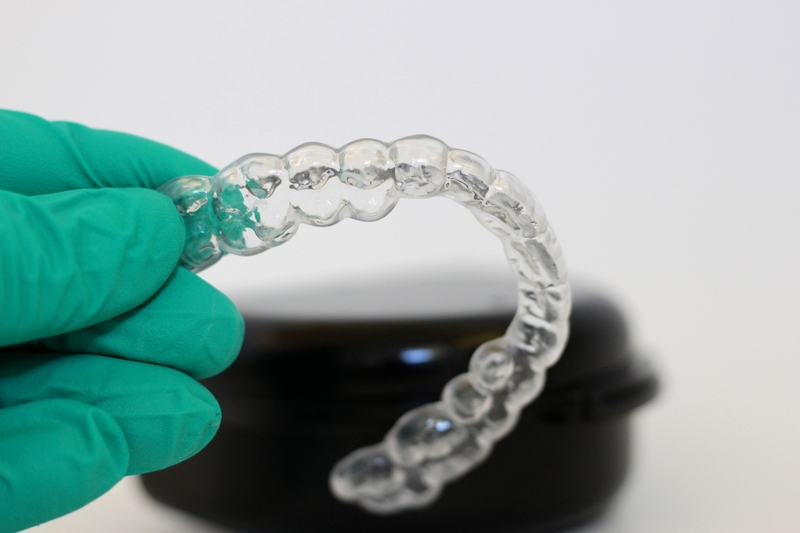 Steraligner is safe for aligners, retainers, partials, sleep apnea dental devices, and mouth guards. Safe for retainers that contain metal solder, when used as directed. The Steraligner Starter Kit includes one 16 ounce bottle of Steraligner solution and one soaking dish with a built-in measuring line. That's enough for a month of cleanings if you use it every day. 1. Pour the Steraligner liquid into the soaking dish (provided) up the measuring line. The amount you use is a little more than one Tablespoon (about a half-ounce) of the Steraligner solution. 2. Place your aligners, retainers, or other dental appliances into the dish. Then, add just enough cool or warm tap water to cover your dental appliance. (Do not use hot water -- a hot temperature could warp your aligners or retainers). 3. If desired, screw on the lid for the soaking dish and gently agitate the cleaner. (Or you can leave the container uncovered and just soak your appliance). Leave your dental appliance soaking for 3 to 5 minutes (depending on the level of soil on your dental appliance). 4. If desired, brush your dental appliance with a soft brush, or a cotton swab (Q-Tip) to remove any excess soil. (Be careful not to get any of the liquid into your eyes). 5. Rinse your dental appliance with fresh running water. 6. Discard the used Steraligner liquid and rinse the container for the next use. Use Steraligner every day to prevent white plaque buildup and kill the smelly bacteria from your dental appliance. Ingredients: Water, Surfactant, Isopropyl alcohol, Sodium Bicarbonate, Natural Essential Oil Extracts, Sodium Benzoate, Sodium Gluconate, Disodium EDTA. Do not use inside your mouth or take internally. Keep out of eyes and out of the reach of children. Dr. Daher developed such an effective and simple formula to help his patients keep their aligners and retainers clean. Steraligner is really easy to use and is an effective way to kill the germs that cause dental appliances to smell bad. We like this product, and we're sure that you will, too! Thank for your question, Angel. Steraligner was developed by an Invisalign orthodontist to clean Invisalign aligners, but it can be used on any type of oral appliance or aligner. The difference between this product and the Cleanse Fresh & Go Spray is that Steraligner has been proven to kill 99.9% of bacteria. I had my Invisalign for 10 days, cleaned them as instructed. They were still turning yellowish and cloudy. I read other reviews on products and decided to try Steraligner...BEST choice! Easy to use, my asligners stay clear and feel clean! I soak them every morning while I am drinking my coffee, brush them and they are ready to go! LOVE this product! This cleaner is the perfect solution to getting my daughters retainer finally clean and free of built on plaque that other cleaners couldn't seem to do. She's so happy to use it every day! So many of our patients contact us a year or two into wearing their night guard and want to know how they can keep their dental night guard clear like it was in the beginning. This product works! We always recommend Steraligner to our patients. It's a solid product! was still a slight odor sometimes. Steraligner keeps my aligners fresh smelling each time! ProsLove the mint taste & quick cleaning. ConsWish you offered a special price when you bought multiple bottles or sold it in larger bottles. I don't need a new container each time either. Arrived on time. It is very effective & you need to use very little. A huge improvement over the dissolving tablets. Gave this a try and really liked it. Keeps my aligner trays really clean. Five stars! I'd been using denture tablets for my Invisalign but they turned the trays cloudy. I tried this liquid and really liked it. Will definitely be using it from now on! ConsBest to use your own measuring spoon to pour in a tablespoonful. It's a little hard to get the measurement exactly right in the container that comes with it.